1963-1964 Colliery Year Book & Trades Directory. Colliery and former owner prior to Nationalisation. Alfreton Colliery. N.H. & B. Collieries LTD.
Arkwright Colliery. Arkwright Coal Company LTD.
Blackwell Winning. N.H. & B. Collieries LTD.
Bolsover Colliery. Bolsover Colliery Company LTD.
Creswell Colliery. Bolsover Colliery Company LTD.
Doe Lea Colliery. 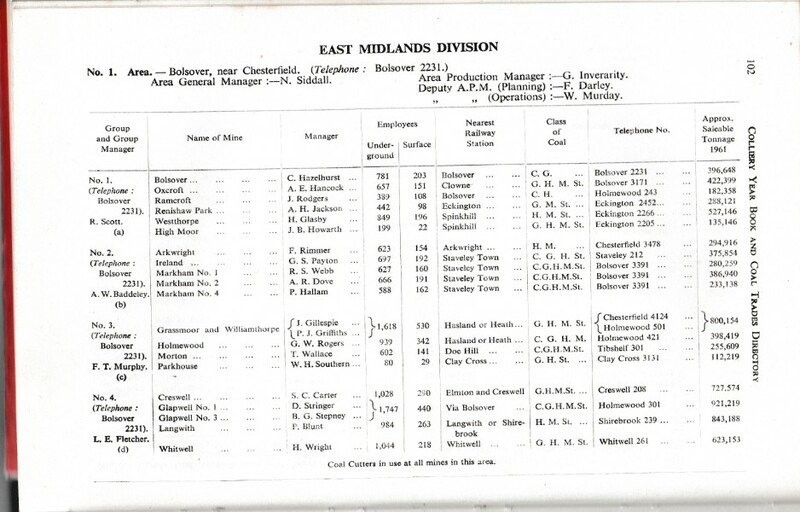 Doe Lea Colliery Company LTD. Licensed Mine. Glapwell Colliery. Sheepbridge Coal & Iron Company LTD.
Grassmoor Colliery. Grassmoor Company LTD.
Handley Colliery. Handley Collieries LTD. Licensed Mine. High Moor Colliery. Leewood Colliery Company LTD.
Holmewood Colliery. Hardwick Colliery Company LTD.
Ireland Colliery. Staveley Coal & Iron Company LTD.
Langwith Colliery. Sheepbridge Coal & Iron Company LTD.
Markham 1,2, & 4 Collieries. Staveley Coal & Iron Company LTD.
Morton Colliery. Clay Cross Company LTD.
New Plumbley Colliery. W. Redfern & Sons LTD. Licensed Mine. Newbold colliery. Pearson & Company (Chesterfield) LTD.
Old Hall Farm Colliery. W.G. Fenwick LTD.
Oxcroft Colliery. Oxcroft Colliery Company LTD.
Parkhouse Colliery. Clay Cross Company LTD.
Pleasley Colliery. Tredeger Iron & Coal Company LTD.
Ramcroft Colliery. Hardwick Colliery Company LTD.
Renishaw Park Colliery. Furnace Hill & Renishaw Park Collieries LTD.
Shirebrook Colliery. Shirebrook Colliery Company LTD.
Stretton Colliery. H. Taylor (Whatstandwell) LTD. Licensed Mine. Warsop Colliery. Staveley Coal & Iron Company LTD.
Westthorpe Colliery. J. & G. Wells LTD.
Wheeldon Mill Colliery. J. S. Gaunt LTD.
Whitwell Colliery. Shireoaks Colliery Company LTD.
Williamthorpe Colliery. Hardwick Colliery Company LTD.